How does the Tip Line Work? When a citizen calls 301-498-7645 (anonymous, untraced number), he or she will hear a taped message. Explain the activity in as much detail as you can. You do not have to provide your name, address, or telephone number. All information is kept strictly confidential. What if I want to speak with an officer directly? You can leave your name and telephone number on the tape, and you will receive a call back as soon as possible. Again, your name will remain strictly confidential at all times. What if I want to report a drug transaction that is happening right now? If you witness a drug crime or any other crime that requires an immediate police reponse, DIAL 911 or 301-725-3000 (the direct emergency line to Laurel Police Department). A patrol unit will be dispatched. 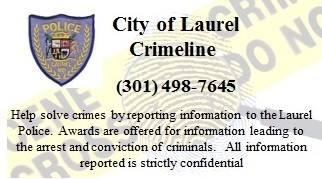 Using the direct emergency line to the Laurel Police Department can sometimes be faster because the call doesn't have to be screened by a 911 operator. You can also send "Tips" to us by E-Mail, if you prefer, instead of using the telephone (voice) tip line of the Department. Your E-mail tips will be held in the strictest confidence. E-Mail your tips to: [email protected].